The U.S. Environmental Protection Agency (EPA) announced the proposed rulemaking for the Renewable Fuels Standard (RFS) for 2018 and the biomass-based diesel volume requirement for 2019 on July 5th. In this article, we analyze the expected outcome of implementing the newly announced mandates. These standards were generally as expected, with exception of the total advanced biofuels mandate which was a bit smaller than anticipated. The focus of the present analysis, then, is on the magnitude of the “push” in production and consumption of biofuels above the E10 blend wall implied by the requirements (mandates) of the RFS and the implications for production and consumption of biomass-based diesel. The analysis follows a similar format of our previous analysis of earlier EPA rulemakings, most recently in the farmdoc daily articles of May 26, 2016, June 2, 2016 , and November 30, 2016. The statute for the Renewable Fuels Standards (RFS) required the U.S. Environmental Protection Agency (EPA) to establish volume requirements for four categories of biofuels for each year from 2008 through 2022: cellulosic biofuel, biomass-based diesel, total advanced biofuel (which includes biomass-based diesel), and renewable fuel (referred to as conventional ethanol here). The difference between the total advanced mandate and the total of the cellulosic and biodiesel mandate is referred to as the undifferentiated advanced mandate and can be satisfied by a combination of qualified advanced biofuels. Conventional biofuels is generally assumed to be corn-based ethanol but this is actually not explicitly required by the RFS legislation. Instead, corn-based ethanol has been the cheapest alternative for this category that also meets the environmental requirements of the RFS. In addition, the conventional portion of the mandate can also be satisfied with discretionary blending of advanced biofuels, so one can refer to the conventional mandate as an implied mandate. 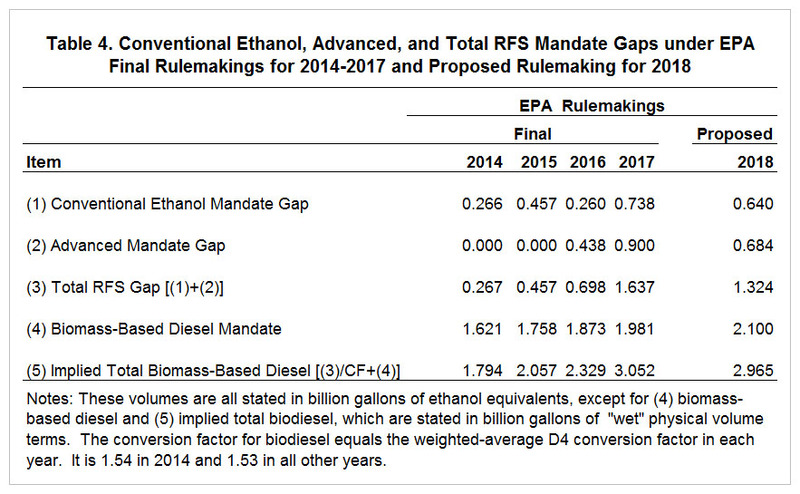 We refer to this implied mandate as the conventional ethanol mandate in order to be consistent with the most common term for this particular RFS mandate. Cellulosic biofuels have been in very limited supply, so the EPA has written down the cellulosic mandate to very low levels relative to statutory levels each year. The total advanced biofuel mandate has also been written down in conjunction with the write down in the cellulosic mandate. The biodiesel mandate was established as a minimum of one billion gallons per year from 2012 through 2022, with larger amounts subject to EPA approval. 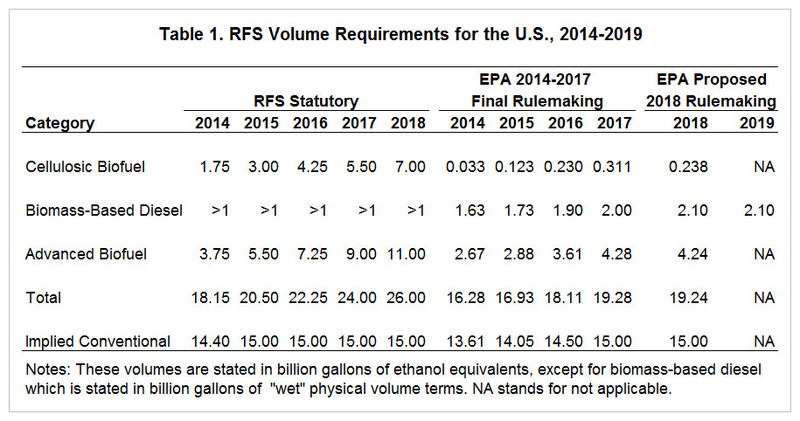 Table 1 summarizes the statutory RFS volume requirements for the 2014 through 2018 calendar years, as well as the mandates contained in final EPA rulemaking for the 2014 through 2017 calendar years and the proposed rulemaking for 2018. For 2018, the renewable fuel volume requirement is established at 19.24 billion gallons, compared to the 2017 standard of 19.28 billion gallons and the statutory requirement of 26 billion gallons. The biomass-based diesel mandate is increased by 100 million gallons for 2018 to 2.1 billion gallons (as established in the final rulemaking for 2017 released in November 2016) and is held constant for 2019. The cellulosic biofuels and total advanced biofuels requirements are slightly smaller than the requirements for 2017 and well below the statutory requirements. The conventional ethanol requirement for 2018 is 15.0 billion gallons, equal to both the 2017 requirement and the statutory requirement. The advanced mandate proposed for 2018 was smaller than expected and a disappointment to biofuel proponents. The reason for this disappointment can be seen by comparing the level of the advanced mandate relative to the minimum level given by the undifferentiated advanced mandate. For 2017, the minimum advanced standard is 3.5 billion gallons and the final standard is 4.28 billion gallons, a differenced of 728 million gallons. For 2018, the minimum advanced standard is 4.0 billion gallons and the final standard is 4.24 billion gallons, a differenced of only 240 million gallons. If the difference for 2017 had been maintained in 2018 the advanced mandate would have been proposed at 4.728 billion gallons instead of 4.24 billion gallons. 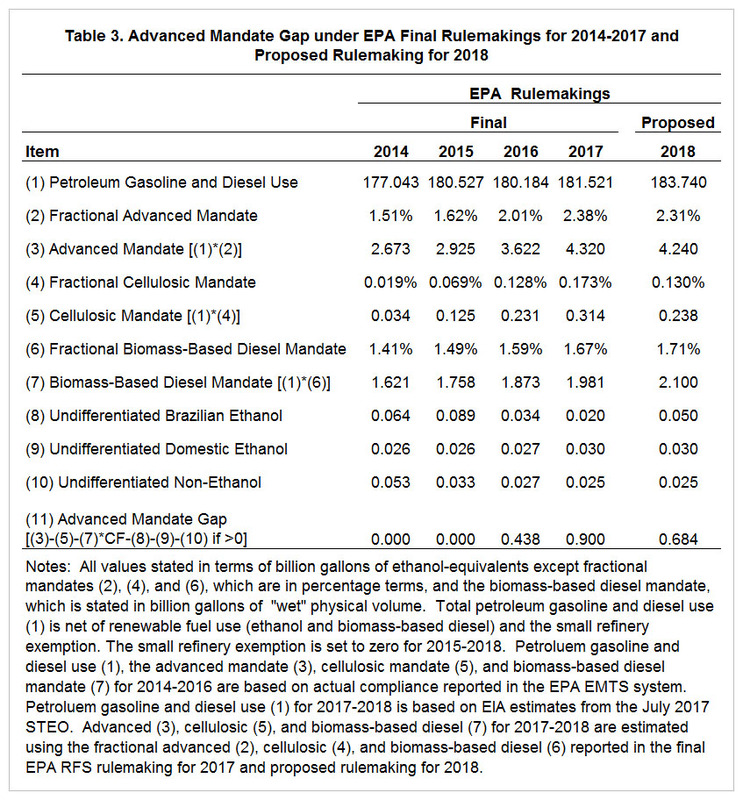 We start the analysis of the EPA proposed rulemaking with a computation of the magnitude of the “push” above the E10 blend wall in the production and consumption of conventional ethanol for each year from 2014 through 2018. 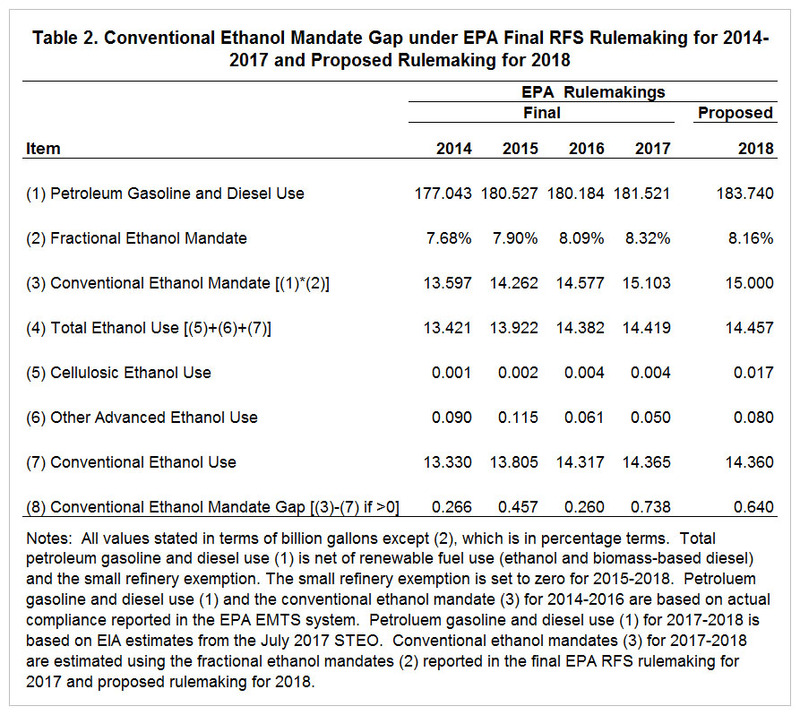 The magnitude of the push is calculated as the gap (difference) between the EPA mandate as implemented and the actual or expected consumption of conventional ethanol. Those calculations are presented in Table 2. To understand the calculations, it is necessary to recognize that the mandate is not enforced as a strictly volumetric mandate, but instead is enforced as a fractional mandate. The EPA establishes the blend, or fractional, rate based on the volumetric mandate and a projection of petroleum-based gasoline and diesel consumption. Obligated parties, then, meet their obligations by blending at that established rate regardless of whether total gasoline and diesel consumption is more or less than the EPA projection. As a result, the magnitude of the final volumetric mandate is dependent on the actual magnitude of gasoline and diesel consumption. The estimates for 2017 in Table 2 require further explanation. We utilize the projection of calendar year petroleum gasoline and diesel use found in the July 2017 EIA Short term Energy Outlook (STEO) report, whereas the final 2017 rulemaking uses the October 2016 STEO. In addition, we do not make an adjustment for diesel fuel use for ocean-going vessels as the EPA does in all prior RFS rulemakings. This adjustment has been about 2.1 billion gallons in recent years. The reason we do not replicate this part of the EPA projections is that available data on final obligated gasoline and diesel volumes for 2014-2016 exceed that estimated by the EPA by approximately the estimate of ocean-going diesel use. It appears that obligated parties do not segregate out these volumes when reporting total obligated volumes even though they are technically not subject to RFS standards. Good, D. "Weekly Outlook: EPA Renewable Fuel Standard Rallies Soybean Oil Prices." farmdoc daily (6):223, Department of Agricultural and Consumer Economics, University of Illinois at Urbana-Champaign, November 28, 2016. Irwin, S., and D. Good. "RFS Standards Beyond 2017--Biodiesel or Bust?" farmdoc daily (6):104, Department of Agricultural and Consumer Economics, University of Illinois at Urbana-Champaign, June 2, 2016. Irwin, S., and D. Good. "The EPA's Proposed 2017 RFS Standards: Is a Push Still a Push?" farmdoc daily (6):100, Department of Agricultural and Consumer Economics, University of Illinois at Urbana-Champaign, May 26, 2016. Irwin, S., and D. Good. "RINs Gone Wild? (round 2). "farmdoc daily (5):224, Department of Agricultural and Consumer Economics, University of Illinois at Urbana-Champaign, December 4, 2015. What’s Up with Ethanol Production Profits?